From Cappadioca to Instanbul, a mammoth drive on Turkish roads around 750 Kms and Turkish drivers are by far the worst we have come across. They scare the beejeebies out of us, looking back they had nothing on the Romanians. Road rules, stoplights and marked roads are merely guides not to be followed. Four lanes can become 2 or 5 depends on the drivers. They overtake on blind corners on narrow mountain passes, drive down the middle of the road and would happily drive you of the side of a mountain and not think twice of it. We have seen more bingles, overturned cars, trucks across the road and cars in ditches than the rest of our travels combined. We are just grateful that not to many of them seem to own cars and stick to the traditional mode of transport, mules, donkeys and ponies. Diving though Istanbul was crazy and stressful particularly after about 10 hours on the road. We were hot, bothered and had had enough of being in the car, any Turkish driver who was silly enough to give us a hard time, coped it back double, behaviour probably not recommended in the guide books. Instanbul – Task number 1, the Romanian Consulate, yep here we go again. So we get organised in the morning, get our passports, pack a lunch and water and head towards the bus stop. We get on the right bus and five minutes into the journey David asks ‘”Did you grab the book with the consulate address?” I say “Aaah no, I though you did.” Not a good start. We remembered that it was in the vicinity of Taskim Square and we also knew that Taskim square was a pretty major landmark in Instabul, so how hard could it be? After learning our lesson in other major cities on the fact that being cheap and not spending money on a map doesn’t work if you want to get around efficiently, we buy one. After a close study, Taskim square doesn’t look that far, but then we can’t find a scale, but it really doesn’t look that far, so we head off. Fortunately for us, a nice Turkish guy had noticed us closely studying our newly acquired map and checked in to see if we new where we were going and kindly pointed us in the direction of the the tram, a far better option than walking. We get of at the appropriate stop, well thats what we thought. After again closely studying our map, we head off up a mountain, well thats what it felt like. We arrived at the top of the hill in a lather of sweat, even our clothes had started dripping, wondering if we really wanted to go to Romania. W e had a choice, left or right, we choose right. After walking a short distance, I’ve had enough and pick the flashiest hotel, knowing they would have AC, to ask directions. We go in looking totally wrecked and despondent, the guy behind the desk takes one look at us and turns his nose up, we ask anyway. After a discussion with his colleague he tells us the consulate is 50 m in the direction we just walked from. We both stare at him unbelieving. I mean fair dinkum, if the guy is going bull dust to us, you would think at least he would be smart enough to send us further away then 50m from his hotel. Giving him the benefit of the doubt, we head back in the direction we had come from. After a short distance I look up and say “Hey David thats the Romanian Flag”, David says, “no you goose thats the Turkish flag”, “Aaagh not that one the other one”. Sure enough had we turned left we would have tripped over the front door! Only thing is there is a map on the front door giving directions to the back door. O man, it’s back down the mountain we just hiked up, we can’t believe it, we practically walked past it. David jokes it will probably close as we arrive, would you believe it, we arrive as it closes. With sweat dripping down our foreheads into our eyes, we stand there blankly looking at the door. W hat next? We must have looked pathetic, we can’t even figure out when it will be open again. Someone comes to the door and we start pleading. “This is our 6th time at a consulate we just want to know if our Visas are approved pleeease help, pleeese.” The guy reneges and says sternly, “O.K. give me your passports I will photocopy them, and come back at 4pm.” Well we figure thats about as good as its going to get. Time to go tourist. We get back at 3.40, we had a better handle on the Istanbul public Transport system by this stage so managed to avoid the mountain climb. We wait around for a while to find out nothings been done, we get a little grumpy at the guy behind the counter, explain our situation. He finally phones Rome, where we applied for the Visa. Then tells us to wait 15mins. 40mins goes by, and he explains that he has not heard back from Rome, it’s our choice if we want to wait until 5pm or come back Monday. Man, its Friday and we want to leave on Sunday morning we opt to wait. Yee ha, Rome phones we can get our Visas, yep we are doing a little song and dance!!!!! Only 7 times back and forth to consulate and embassies in three different countries. The guy behind the counter then looks at us and says that will be 40US$ each. HUH, we just look at each other?? We try explain that we are in Instabul, Turkey therefore have YTL not Florida USA, he just looks at us like we are complete idiots and says “You want VISA here you pay US$.” Crikey, what next. It’s Friday, almost 5pm and there’s no time to even run to a money exchange, they’ve already told us they close at 5pm sharp, no exceptions. The guy behind the counter, makes another phone call and another dodgy guy turns up and takes David into another building to do a money exchange. David comes back, with US$ and informs me that the dodgy guy got cheesed when he found out that we didn’t have Euros, I mean we are in Turkey! The amusing thing to all this is we are meant to have travel insurance, we don’t. For all you people who are going to give us a lecture on the reasons why we should, don’t worry my mum already has. Anyway we photocopied our medicare cards, seems to have worked. Time to go do more tourist things. We jump on a tram to head to the famous Grand Bazar, just so happens, prayer time at the Mosque has just finished. The tram is packed we are sharing it with a group of sweaty, smelly Turkish blokes. At this point the nasal passages are getting a full work load and definitely not of the exotic type. David is in his element, trying to sell carpets to the carpet sellers, bantering with every other shop worker. We go into every store selling water pipes, or nargiles traditional pipes for smoking flavoured tobaccos. I swear we go into every shop in the Grand Bazar and Egyptian bazar that has a shisha in the window. In half of them there is great discussion and debate on the finer details of nargiles. If anyone is interested I’m sure David can give you the information so that as consumers you can confidently buy a shisha that suits your exact needs. Meanwhile I sit or stand patiently waiting. At the end of the day David informs me that he likes the nargile he saw in the first shop we went into. Aaaagh. It’s nearing 6pm so we head to the Blue Mosque, I’m rejoicing to be out of the bazar, but David decides more shopping is in order, maybe the shops on the streets might have something different to the vendors at the bazar. We finally make it, by foot to the parks outside the Blue Mosque, to be joined by a carpet seller. It getting close to 7pm by now, I whisper “David get rid of him or we’ll have to go look at more carpets,” David cheerfully responds, “O thats no problem, he can show us around and we can have a quick look at his carpets”. Aaaagh, after 10 years I finally come to terms with the fact that I’ve been living with a crazed, shopping maniac. The carpet seller walks us to the entrance of the Blue Mosque and gives us a brief history, we take our shoes off and at this point I’m feeling discriminated against. Why I ask do I have to wear a cloth over my head and not David? I’m less than impressed with the Muslim religion and traveling through Turkey has left me with many more questions than answers. Earlier in the day, we saw a 30 ish very sleazy looking guy with a girl no more than 10 – 12 years old. The child was in the dress of a married women and their embrace left us with no question as to the nature of the relationship. The kid still had the lanky body of a child and would have most likely not been older enough to start her regular cycles. We were both repulsed, the guy would be in jail at home. David’s niece would not have not been much younger than this child. We entered the sanctuary of the Blue Mosque, no shop vendors. It was beautiful and impressive. I plonk onto the silk carpets amongst the small crowd and promptly tell David, we can’t leave as the carpet seller will be waiting outside. Sure enough when we leave the carpet seller is waiting. David is happy about being led towards another Bazar, I’ve had it. We eventually make it to the carpet shop, to be descended upon buy another 3 carpet sellers and led up 3 flights of stairs. They cheerfully respond “Sure thats what you do on vacation, spend money on things you don’t need.” Aaaagh get me out of here. I’m sick of shopping, my nasal passages have well and truly been overloaded, my feet are sore, I’v stepped in chewing gum, I’ve got a layer of dust and sweat so thick it looks like I’m having a therapeutic mud bath, it’s 7.30 at night, we still need to get on a bus to get back to the Van and the traffic is chaos. It’s after nine by the time we get back to the Van, David pulls the Banjo and starts happily plucking away, honestly I will never shop with this man again. We eventually collapse into bed after having a top day and finally getting our Romanian Visas. Day 2, first stop for the morning is the Topkarpi Palace, 10YTL each for entrance, it was nice, but we didn’t feel the need to linger very long. The best part of the Palace is meant to be the Harem, but to see this we would have to put our hands in our pockets yet again, another 10YTL each, we decided to pass. Next stop was to locate the first shop we went into yesterday in the Grand Bazar and buy the first nargile, that we looked at yesterday. We located it without to much trauma and would you believe it, the nargile was sold, man, you should of seen the look on David’s face, disappointment. Man, you should have read my mind, here we go again. 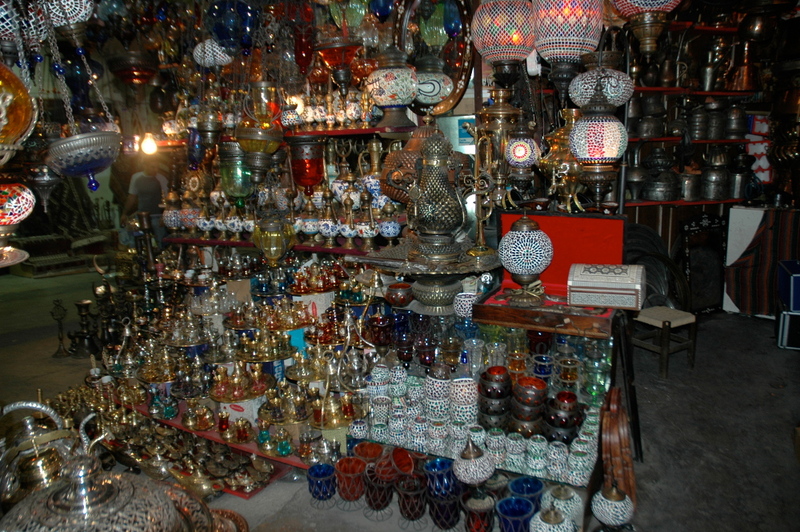 After much more great debate and discussion and traipsing back and forth between the guys shops we finally end up in the bowels of the bazar at the factory, that we guess all the vendors get there nargile from, there were shelves lined with nargile, hundreds of them. At this point I’m thinking why didn’t we just come here first thing yesterday and save all the drama. I take a seat, get given a cup of tea and wait patiently, while the virtues of almost every nargile in the room are debated, crikey is this ever going to end. Finally David finds a combination of pipe, hose and base that he is satisfied with so we head back to the guys shop to discuss price. The shop vendor really has the upper hand and David really wants that nargile, so we probably don’t get the best deal, but at this point who cares! We spent the rest of the afternoon shopping for other bits and pieces. David is astounded by my bargaining and ability to simply walk away to see if I have the best price and move to the next shop. I tell him it’s there game not mine and I’m sick of feeling like I’m been ripped of so I’m going to give as good as I get. If they give an outrageous price for a product I give them and equally outrageous price back. I’m actually starting to enjoy this shopping caper, but I think David’s starting to get a little weary. We shop for a few more hours and exhausted and layered in sweat and dust again, with our hands full make our way back to the Van to try to squeeze all the stuff into spaces that don’t exist in the trusty Renault. Aaaagh an Italian van has parked next to the Renault, I mean the park is practically empty and as you know we are not the biggest fans of Italians. Turns out they are really nice, from the north of Italy and the guy has travelled extensively around the world so we invited them over for drinks. They regaled us with stories of their travels through Bulgaria, not good, corruption, bribery, bad roads, being attacked by rabies crazed dogs, well thats a small exaggeration, we were pretty nervous already about Bulgaria and Romania now we were truly nervous. Tomorrow we were heading for the border. The caravan park, we were in wins to date as the worst. It was run down, no info or tourist brochures whatsoever of Istanbul, no other facilities, the bathrooms were average at best. It stank due to a creek not far away. To our amusement it was practically a farm with a collection of chickens, ducks, sheep, turkeys and cats. To top it off we paid 36YTL for the privilege of staying here! Traveling through Turkey was never mundane, we were constantly on our toes, it surprised us and let us down. We were never quite sure what to expect next. It was definitely more expensive than we had of hoped, which was a real bummer and it was dry and dusty with the Van constantly covered in a thick layer dust. Turkey also so has an enormous military. It always amazed to when we would be driving through small towns looking for gas or bread to see new stands with pornographic magazines with images of mostly naked women on the front, how can this work in a country where the women are expected to be covered from head to toe? We have enjoyed our time here but it has been pretty exhausting and we are happy to be moving on. All for now, more shortly.